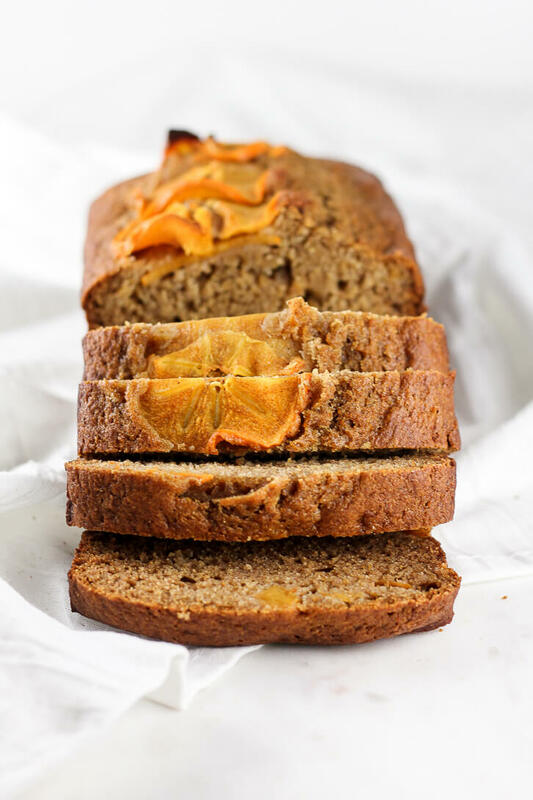 This persimmon bread recipe calls for a simple, spiced quick bread with both persimmon puree and diced persimmons in the batter. Today’s persimmon bread recipe is dedicated to my grandmother, who always does her best to take care of me, even though I’m all grown up now! When I was about two years old, our family moved in with my dad’s parents, and never left. Since my parents both worked full-time, my grandparents did a lot to help raise me and my younger sister. In particular, my grandmother took us to school every morning and stayed home with us if we were sick. And whenever my parents had to work late, she would bring me home a Johnny Rockets hamburger (my absolute favorite at the time) from the mall where she worked! Seriously, this was like major points in my book. Today, my grandmother still lives with my parents, and she still loves to try and take care of me and my sister! Every time we visit home, she sends us away with bags full of nuts, and fruit, and other little packages, despite all our protestations. Once, my husband and I ended up with a brand-new rice cooker! On our most recent visit, my grandmother chose several lovely-looking persimmons to send us home with. Nothing against persimmons at all, but they just aren’t a fruit I would normally choose to snack on. So, I started thinking about how I could incorporate the persimmons into my baking instead. I was especially interested in trying to make a persimmon puree, and using that as a base for a recipe. So I decided to go with a simple quick bread that would really let the persimmons shine. There’s a full cup of puree in this persimmon bread, and I also added some diced persimmons to the batter, plus a few very thin slices of persimmon layered on top. As I was doing some research for this persimmon bread recipe, I discovered that there are actually two main types of persimmons in the world: Fuyu and Hachiya. And apparently, there is an important and significant difference between the two! Fuyu persimmons (which I used for this recipe) are sweeter, have a more rounded bottom, and can be eaten while still on the firm side. Hachiya persimmons, on the other hand, are more conical at the bottom, and need to be very very ripe before they are ready to eat. I can’t speak from personal experience on the matter, but apparently, eating an unripe Hachiya persimmon is a terrible experience. You’ve been warned, choose your persimmons wisely! Whether you’ve long loved persimmons, or whether you’ve never had one before (like my husband! ), I really think you’ll enjoy this persimmon bread. I was especially happy with how moist it was from the persimmon puree (along with the Greek yogurt and honey). Slathered with butter, a slice of this bread makes for the the perfect breakfast treat or mid-afternoon snack! And if you’re looking for another great quick bread recipe, try this whole wheat chocolate chip zucchini bread made with olive oil and honey! In a large bowl, whisk together both flours, baking powder, baking soda, salt, and spices. Set aside. In a medium bowl, whisk together the sugar, honey, yogurt, eggs, and butter. Add the persimmon puree and whisk to combine. Pour wet ingredients into the dry ingredients and stir to combine. Fold in the diced persimmon. Pour into a loaf pan and top with persimmon slices, if desired. Bake at 350 degrees for 50-55 minutes, or until a toothpick inserted into the center of the loaf comes out with just a few moist crumbs attached. Let cool in pan for 5-10 minutes, then transfer to a wire rack to cool completely. If you bake a loaf of this persimmon bread, I’d love to see how it turns out! Don’t forget to post a photo and tag @flourcoveredapron on Instagram to share.